USMLE and Residency Tips: How competitive is your specialty of choice? How competitive is your specialty of choice? The choice of a medical specialty is driven by the desire to pursue a specific field. This motivation can be multifactorial (personal, monetary, professional choice etc) and dictates which programs a residency candidate will apply to. In addition to personal motivations for choosing a specialty, there are also match specific factors to consider which can improve overall chances of matching. One such factor is competitiveness of the specialty that you are applying to. If there are a 100 options for one correct answer then the chance of being right is 1%, however if there are 4 options, then the chance that you will be correct with will be 25%. Thus knowing where to place the bet makes the scales tip in your favor. This is especially true when the applicant does not know how difficult it is to get a residency in a particular specialty but applies any ways. Doing such will lead to wasting time, money and effort - all of which are core foundations of productivity. Even if the desire to apply to a particular program is great - for example, Dr. John Doe, an IMG decides that his life's mission is to do dermatology, then knowing how the odds are stacked against him, helps him prepare to ensure the best possible outcome. The figure below shows the number of total positions per total applicants to respective specialties. As you can see, the number of positions per applicant (PPA) is charted on the Y axis and the specialties are on the X axis placed in increasing order. The number next to the line denote the actual position to applicant ratio which can be also expressed as a percent chance of securing a position based purely on probabilities excluding all the factors influencing interview invitations and ranking (scores, YOG, contacts, IMG friendly states etc). Immediately one is drawn to two segments of the line. Segment 1 comprises of radiology and neurology which are more relevant to medical graduates trained in international school as compared to the reference subjects, dermatology and radiation oncology to denote the lower end of the spectrum. It is interesting to note that the PPA for neurology (0.36) and radiology (0.195) is far less than some other IMG friendly specialties like family medicine or psychiatry. Thus one should take into account this factor when applying to segment 1 specialties. Segment 2 includes the IMG friendly core group of family medicine, internal medicine, psychiatry and pediatrics. All of them lie on the plateau part of segment 2 with out much variation in the PPA score. Of note, family medicine (0.505) had fewer total positions to the number of candidates applying to this specialty and this may be a reflection of the increased number of applicants who consider FM as a back up or apply to FM thinking that criteria are less stringent than other specialties. 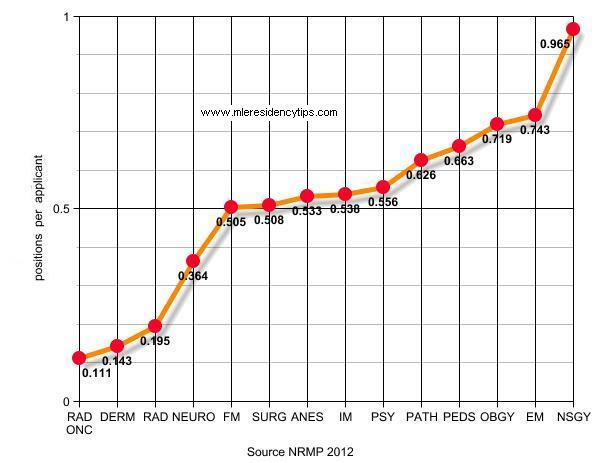 The PPA score for other specialties is listed on the graph. Interestingly, neurosurgery had fewer applicants compared to the total number of positions offered raising the PPA score to almost 1!